Arrow is a very flexible element: it can be used as a separate graphical element, as a background … Let’s find out several cases where we can apply hand drawn arrows. Thin ink arrows are the best idea for such kind of charts: they don’t occupy much place and don’t gather too much attention. 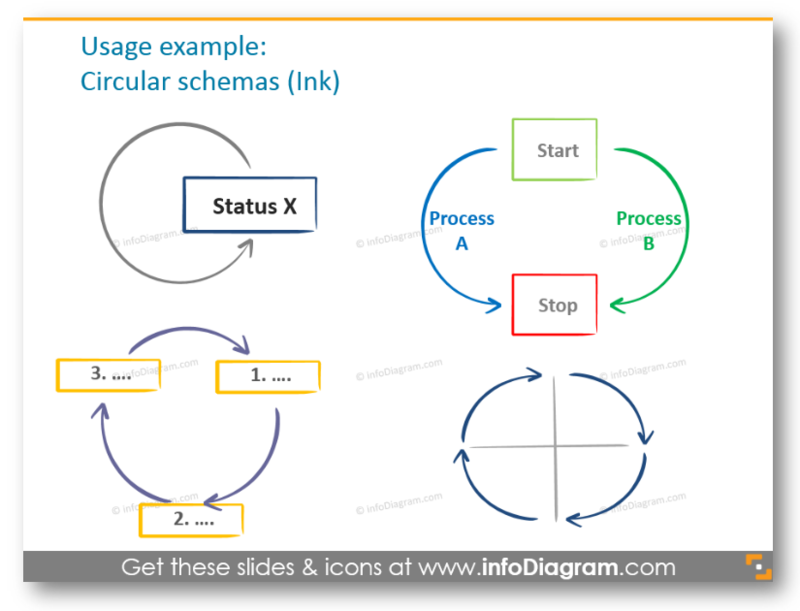 By noticing different colored or gray ink arrows you can easily catch the meaning and diagram flow. You can also apply scribble style on the boxes to make the slide look unique. On the image above you can see the example o the flow diagram in charcoal style. 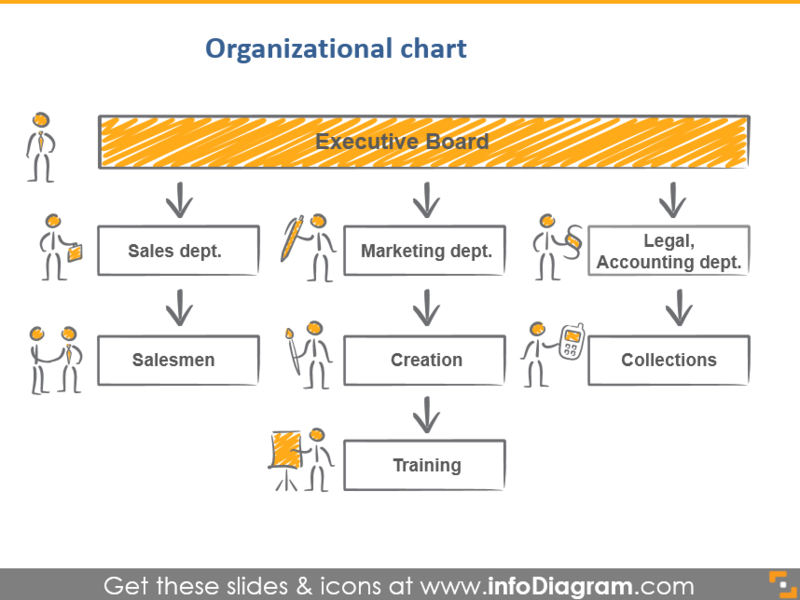 Here’s the example of a company’s structure diagram made with the simple rectangle shapes and ink arrows. Looks more creative and interactive. 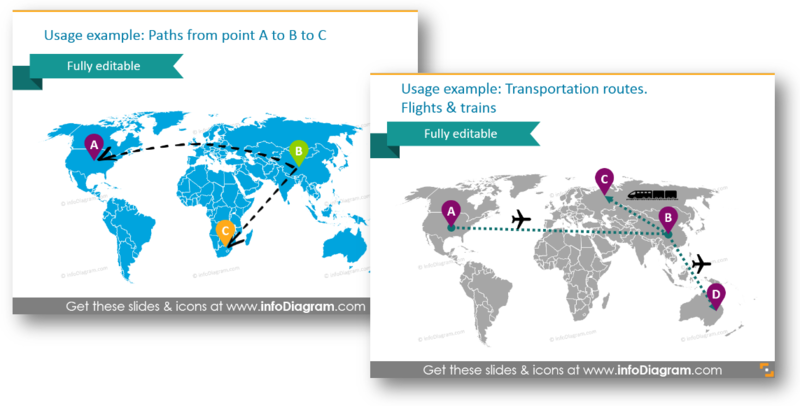 Very common arrow usage – to show transportation routes or distribution paths. Use ink or line arrows and you won’t distract attention from the map on the background. 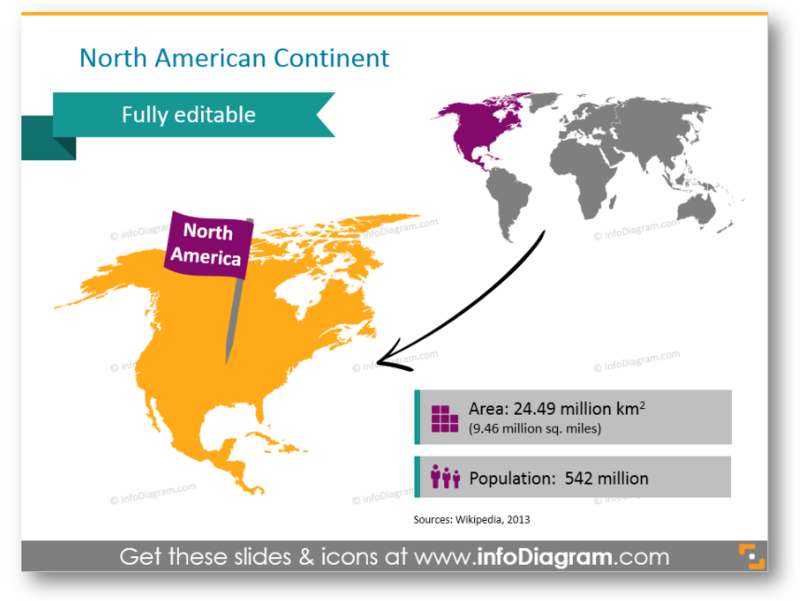 Or if you need to show the country’s place on the map, you can do it like in the picture above. 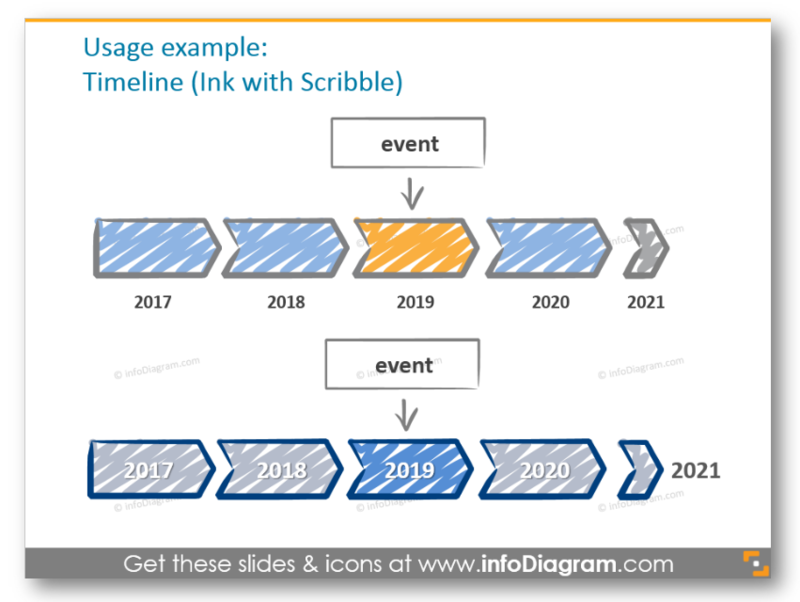 You can easily create such authentic timeline with simple forms in 2 minutes or use this pre-designed slide. The color, style and filling can be changed. Here’s another variant of arrow timelines, for those who prefer flat style. The gray arrow on the background is almost inconspicuous and looks good in the tandem with teardrop shapes. 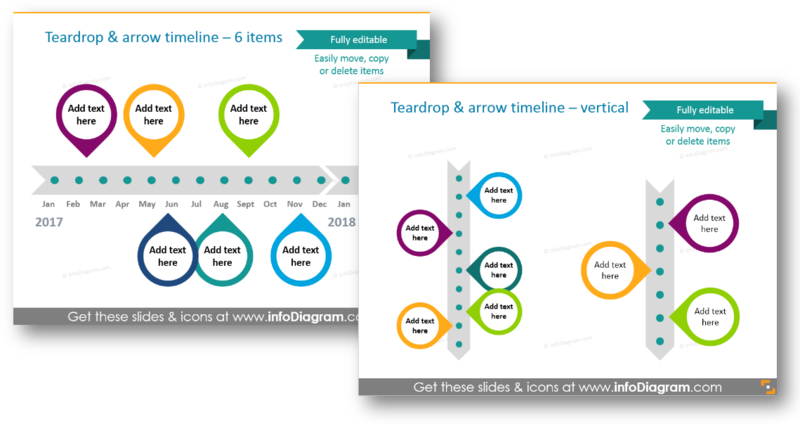 Check out 7 types of timeline design here. What’s inside Hand drawn Arrows set? The collection contains 124 various arrows vector shapes on 22 slides in 3 hand-drawn graphical styles: charcoal line, ink lines with scribble filling, freehand doodle pencil style. You can choose colors to correspond with your brand and the color scheme and layout of your presentation. 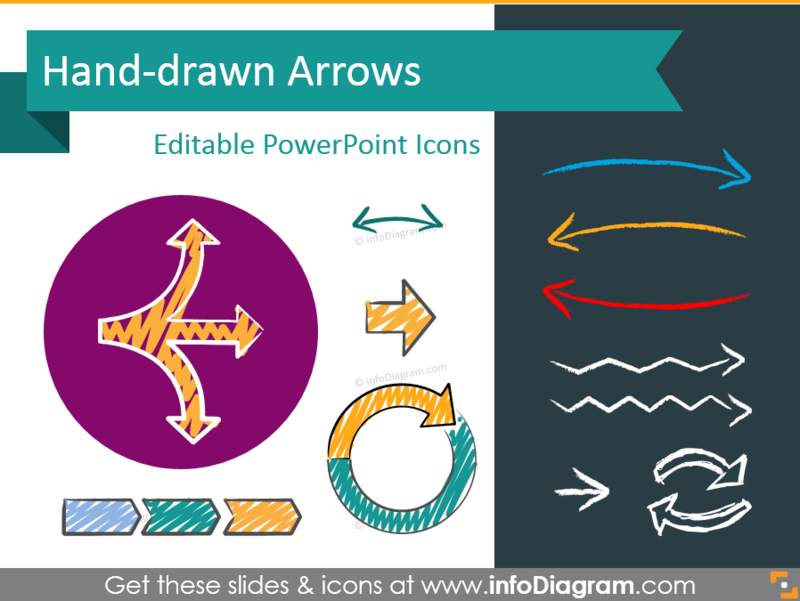 All arrows and shapes are editable vector artwork so you can adjust them as needed, using standard PowerPoint tools. And they remain razor sharp also if you resize them, unlike bitmap pictures. 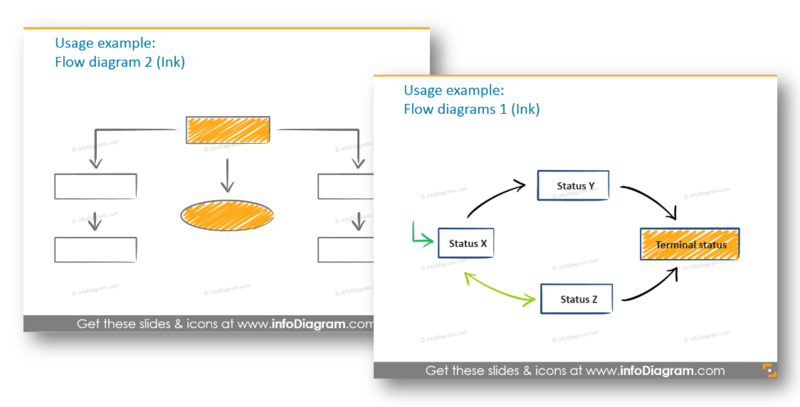 All arrows and chart examples above are from our infoDiagram PowerPoint Diagrams collection. It contains arrow shapes in various styles, which can be easily edited and added to other presentation.